Fly foot gets a grip with sticky hairs and with claws shaped like a set of bull’s horns. 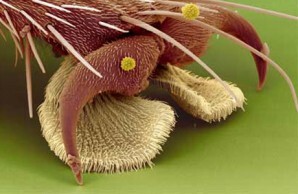 In the false-color scanning electron micrograph, the footpads of a syrphid fly (Eristalis pertinax), depicted in beige, are covered with minute hairs, or tenent setae. The hairs both increase the contact area of the fly’s foot and secrete a sticky fluid, enabling the fly to walk upside down. The set of claws can help the fly pry its footpads loose. The image is magnified 120×. My mother is a rock climber, the familial human fly. She practices endlessly on walls and cliffs, refining her ability to stick to vertical surfaces and overhangs. Watching her, I’ve had plenty of time to contemplate the biomechanics of her gravity defiance. As she glides up a wall and then spiders along upside down across a “roof” section at a local gym, her aerial ballet testifies to the powers of friction and adhesion. In fact, the same interplay of forces enables a real fly to stick to walls. One day human climbers may borrow some of the fly’s tricks for holding fast. Fortunately for the fly, nothing in nature is perfectly flat and smooth; any interaction between surfaces is really a story of bumps hitting lumps. Friction is the force that results when the bumps on one surface smack into and snag on the lumps of another. Adhesion, a close cousin to friction, is the result of the molecular attraction between two materials as they are being pulled apart. Usually, though not always, increasing the adhesion between two surfaces increases the friction, too. Together these forces enable flies to walk just about anywhere. Stanislav Gorb and his research group at the Max Planck Institute for Metals Research in Stuttgart, Germany, have examined the footfalls of dozens of insect species. With electron microscopy, high-speed video, and clever devices for measuring forces, Gorb’s group has looked at how these creepy crawlers attach and detach themselves from surfaces. Flies, beetles, and thousands of other insects depend on a system of hairs to hang on. For all their clinging power, though, sticky feet do exact a cost: the better the fly sticks to a surface, the harder it is to get unstuck. Under the electron microscope you can see that a fly’s foot ends in a soft pad covered with tiny hairs, called tenent setae. Each hair terminates in a delicate spatula that maximizes the contact area of the foot by flattening against the surface on which it stands [see micrograph below]. Increasing the contact area increases the frictional forces that keep the foot rooted down. Rock climbers, too, try to increase surface area for a better hold by “smearing,” or spreading the balls of their feet over rocks. But flies do something even more active and interesting to get a grip, as Gorb’s group found. By flash-freezing surfaces where flies had been walking, the researchers highlighted the sweaty little footprints that flies leave wherever they go. Under pressure, the flies’ footpads secrete an emulsion that, like ice cream, is a mixture of sugars and oils; the goop coats the tenent setae and creates a strong bond between hair and surface through capillary adhesion. This form of adhesion is familiar to anyone who has ever found an advertising flyer on the windshield: a dry one flutters off, whereas soggy paper clings stubbornly to the glass, even while you drive down the highway. Flies have four ways of detaching a foot from a surface, as Stanislav Gorb and his group observed. 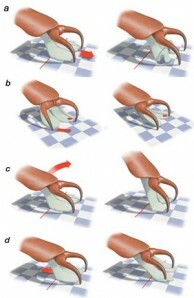 A fly can push a foot away from its body, causing the footpads to fold up and lift free (a); twist its footpads free (b); peel off the back of its footpads by planting its claws and rocking its foot forward (c); or simply yank backward, scraping its claws across the top of its footpads (d). That same stubborn adhesion presents a problem for the fly. If its feet stuck too well to whatever it landed on, it would have to just stay put and order room service. So how does it get unstuck? Gorb watched hundreds of videotaped detachment events at a slow speed. What he found is that the fly has not one strategy, but four, for freeing up a stuck foot. Pushing the foot away from the body tends to scrunch up the footpads, popping them free. The other options are twisting the pads loose, prying them up with the help of two little claws on the end of the foot, or simply yanking them away from the surface with brute force. No fly in its right mind is going to want to go to all that trouble unless it’s absolutely necessary. Usually, when walking on a ceiling or a wall, the fly has a relatively slow gait because four of its feet are attached to the surface at any one time. On the ground, though, flies can save energy by walking like most other insects, with only three feet on the ground. The insect’s six legs form alternating tripods, with the body supported by a fore and a hind limb on one side, in concert with the middle limb on the other. The ground gait is the six-legged equivalent of a trotting horse that has two feet planted at a time—and, just as a trot is faster than a walk, the trotting fly is a faster fly. The damp nature of fly-foot contact has other consequences as well. In high humidity and under strong pressure, the fluid between the tenent setae can act like grease, causing the foot to slide. So flies have adopted a cockeyed strategy for hanging onto walls. If a fly stood vertically on a wall, the forces on its footpads would tend to detach the setae. Next time one lands on a fridge door near you, notice that the fly stands at an angle. In that position, the setae are pulled in the direction of strongest attachment—diagonally. For the same reason, the hardest thing for flies to do is walk headfirst down a wall; they can do it, but they are barely hanging on. Gorb’s group is now working on patterning various materials to scale fly feet up to human size. With photolithography and laser drills they etch a mold of tenent-setae look-alikes, then pour in a liquid polymer that solidifies into a flat sheet studded with hundreds of thousands of tiny, flanged columns. These prototypes have a long way to go before any of them is ready for wall walking. But I’m certain my mom will be first in line for a full set of fly feet.